Tag line: "The Man Who made a Monster"
Frankenstein opens with a warning. Actor Edward Van Sloan (who also plays Dr. Waldman in the film), appears suddenly from behind a curtain, and speaks directly to the audience about the film they are about to see. “I think it will thrill you”, he says, “It may shock you. It might even horrify you”. Today, this caveat seems a bit silly. Over the years, Frankenstein has lost most of its ability to frighten. However, even back in 1931, there was more to this film than the horror it generated. Thanks to director James Whale, Frankenstein also has an air of agitation about it, a sort of chaotic imbalance that, at the very least, still manages to unnerve you. 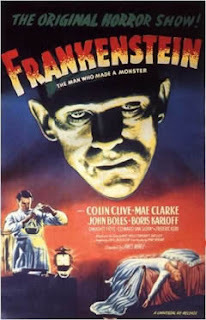 Noted scientist Dr. Henry Frankenstein (Colin Clive) is about to uncover the secret to creating new life. Having re-assembled body parts he amassed by robbing graves, Frankenstein needs only the perfect brain to complete his creation. When Frankenstein’s assistant, Fritz (Dwight Frye), accidentally destroys the healthy brain, he instead presents the doctor with one that belonged to a psychotic criminal. Frankenstein’s experiment is successful, and his creation is, indeed, brought to life. However, the doctor's joy soon turns to horror when he realizes that his creation (Boris Karloff) is a monster. Locked away in a laboratory, the monster eventually escapes, and begins wreaking havoc all across the countryside. It doesn’t matter how old the film is; Frankenstein can still give its audience the creeps. The opening scene, which takes place in a dark, foreboding cemetery, has Frankenstein and his assistant, Fritz, digging up a freshly buried body, and it is positively chilling. Even today, this opening is enough to start your skin to crawling; just imagine how it must have played in 1931. Then, of course, we have the now-infamous scene where the monster accidentally drowns a young girl named Maria (Marilyn Harris). While many were surely stunned by the drowning itself, it’s the image that follows it, that of Maria’s distraught father (Michael Mark) carrying his daughter through the streets of the village, that really got to me. As he's carrying her limp body, Whale keeps the camera on him, following along by way of an impressive tracking shot, and the effect is magnificent. This sequence shows the tragedy of death, and results in an almost fanatical sense of outrage among the villagers. It is still very powerful to watch. While the screams may have gone silent, the unsettling atmosphere of the film has survived for 80 years, and will most likely continue on for many more to come. Listening now! I seen the list of movies covered and sounds great already. Doctor Shock - Sincerely a great debate on Dead Silence, I thought you were going to blow your top, Hahe. That movie was very creepy and kept you entertained. It is so ironic, I think Hell Hunter mentioned get out the popcorn, I was actually eating popcorn during the podcast. What is the chance in that? Great theme of movies. That song Lady Phantom chose bites the big one. Frankenstein, it has been 30 years since I watched that maybe it's time for a rent since you think it is one of the best horror movies coming in at a 10. @Anonymous: I couldn't agree with you more. I love FRANKENSTEIN, and it is definitely a pure classic. @Frannie: Yes, I came across this fact AFTER I had selected FRANKENSTEIN as this show's pick. Another one celebrating 80 years is DRACULA, but I've already covered that film on the blog (AHHHH...I'm kicking myself! I should've waited and made that a Chills of Yesteryear pick also! Oh well, live and learn!). And yes, FRANKENSTEIN surely isn't as frightening anymore as it once was, but it is still a great, great film! @dutchboydreab: I'm so glad you enjoyed the show. We do our vest to keep it interesting, and it's nice to hear we manage to do just that. And enjoy the movies! Please stop back and let me know what you think after you've seen them. @Drelman: Yeah, it sure was a spirited debate! I think the reason I was disappointed with the film was two-fold: 1. I had just watched it earlier that day, so it was fresh in my mind, and 2. There were so many well-done elements that it really made the bad seem all the more sad. DEAD SILENCE is a scary film: I was certainly scared a few times, and some of the scenes worked really well. But the filmmakers just didn't take the time to make many of the character's actions seem believable, and in the end it hurt the movie for me. As for the give & take with Billchete, I agree that that's what makes the show so enjoyable: the ability for every host to voice their honest opinion. A few disagreements will surely result, but what's great about Planet Macabre from a host's point of view is that it gives us all the opportunity to sound off about what we like and what we don't. There's never any hard feelings following a show; we all greatly respect each others opinions, and we know in the end that any disagreements sprang from our mutual love of horror movies. Thanks again to everyone for stopping by, and for listening to Planet Macabre. @RW: Thanks for stopping by! Your comment came in as I was typing up my response above. Listening to the debate now, I certainly sound much more agitated than I remember being as we were recording the show! Oh well, I guess the microphone doesn't lie, does it! I do agree with you that it's a creepy movie, and when it worked, it worked very well. It was the 'other' stuff (the characters doing things that any reasonable person wouldn't do) that bothered me. In the end, I agree it's worth checking out. I just wasn't as impressed as everyone else. And definitely check out FRANKENSTEIN again. As I said, it may not have you covering your eyes in fright, but it will leave you with a chill running up your back! Thanks again for stopping by, and for the comment. Thanks also for listening to Planet Macabre. Hi, I have followed BillChete for years even before his horror days, when he was a host of the Tennis Ballers Podcast. I love his style and he always makes sure he gets his point across no matter what, he says it like it is and it is a wonderful thing to hear, I always know where he stands. You really showed me something Yes Shock! You are the first co-host that ever strongly held on to your convictions. I loved that Yes Shock! You are now my second favorite host of all podcast hosts no matter what the subject is. You will surely be getting a following if you maintain that integrity. Episode 11 is my newest favorite episode of Planet Macabre. Strong opinions and strong statements, wonderful! A new follower of yours Yes Shock! @Roy: Thanks so much for the new name...I like it! Thanks also for the kind words. I'm a great admirer of Billchete's as well (though it seems like you've been following him longer than I have). He does offer very strong opinions, and you're absolutely right: one of the great things about him as a host is you always know where he stands. In this case we simply didn't see eye-to-eye, and because I felt DEAD SILENCE had the makings of being an exceptional film (and actually WAS exceptional in many way), it's shortcomings became all the more apparent, and were all the more frustrating to me. I had to say what i felt! One of the great things about Planet Macabre is that it allows for such differing opinions. it's what makes the show so much fun to do, and it seems our enthusiasm comes through to the fans as well. I am honored to be your 2nd favorite Podcast host, and I thank you again for the kind words. Thanks also for listening to Planet Macabre. Bless you sir for mentioning my small comment on the recent episode. That was nice. This show I have many horror movies to buy, 4 reviews + 5 picks = 9, actually 8 I have Child's Play. The collection is growing and that is why I listen. @Hixster Hollows: It was my pleasure, a small token of my appreciation for your comments, and your continued support of the show. And enjoy the movies! Please be sure to stop back and let me know what you think of them. Thanks for stopping by, and for listening to Planet Macabre. Hey Dr remember me I am the one who buys movies that average 6 and above. Welp on the latest ep. I have 4 to buy, alright! Great ep., fun listen. Hello, and thanks so much for stopping by again! I'm glad we've given you a few more movies to check out! Please be sure to stop back and let me know what you think of them. A suggestion for you; It is really hard to read through all of the comments. Is ther a way for you to add like a dummy picture or something to certain comments. It all runs together hard to decipher. I definitely sympathize with regards to the comments (I myself have a hard time looking through them sometimes). That's one of the drawbacks with the 'anonymous' comments: they don't have any avatars to distinguish them from other 'anonymous' ones, and they all just kinda clump up! I try to answer each one as quickly as I can (that way, my comments, which always have a pic attached to them, can act as a sort of "seperator"), but with people commenting early the day the show's released, I don't always get a chance to do this. I will look into it further with Blogger, and see if there isn't something that can be done to make them easier to read. Thanks for the comment, and for the kind words about the podcast. Thanks also for listening to Planet Macabre. I knew the "monster movies" would be hitting the chills section sooner or later. Nice selection sir. Puppet pod is dead on the ratings. I had seen them all and the over all averages came in at about my rating. Bonus pod was a treat. Something fresh and new and I liked all the personalities very much. @mansueto: Glad you enjoyed the show! I agree: Frankenstein is, and will always remain, a time-honored classic. As for zombie films, there are a few interesting pre-70's zombie movies to cover. Stay tuned! BRAVO engaging episode the recent release. You can't go wrong with demon dolls can you. @Stooey: Thanks for stopping by. I'm glad you enjoyed the episode, and yes, with a few of the films anyway, the "Devil Dolls" proved to be pretty intense! Thanks again, and thanks for listening to Planet Macabre. Nice pick choosing Frankenstein, can not go wrong by any means. I didn't know where to leave these comments so I will post them here on the last 3 episodes. Easter theme-Excellent topic and never heard of any of the movies talked about. I love finding out about horror movies that are uncommon. Bonus theme-Outstanding a one of a kind episode, guests, detail, analysis, rating system was incredible. Doll theme-The last 2 reviews DollyDearest & DeadSilence I will be buying, they sound incredible. You came across a little peaved on this episode. Even your scares were low, maybe not your cup of tea? I loved the battle on DS, but I would have to agree with Billchetie. Why would the cops confiscate a dummy? Just about every home there is dolls of some sort and why would the cops believe anything the supposed killer said. Killers lie out there teeth. The fault that sounds like to me, bare in mind I haven't seen it, but by the review, is why would they let him go, if he was the only one there you would think they would hold him. Thank you and all the workers on PlanetMacabre for giving the horror fans an incredible show. I love it. @Teague: Thanks so much for stopping by, and for the excellent comment. Glad you enjoyed the Easter theme (there were a few good ones in there) and the bonus episode (I agree, the guests were excellent). As for the doll movies, no I didn't find any of them particularly scary, though I did enjoy a few of them. Oddly enough, the one that DID scare me (it came in at an 8.5) was Dead Silence. I don't know, I would think that a ventriloquist dummy lying in a heap on the floor of an otherwise well-decorated room might draw the attention of the police, especially since it's the scene of a murder. But even if it didn't, when the lead character tells the cops that the dummy arrived just before the murder was committed, wouldn't the police at LEAST want to take a look at it, to see if it yielded any clues? I mean, even if they DIDN'T believe him, why ignore a possible clue? Oddly enough, they didn't even bother with the doll. I'm guessing this particular precinct has a LOT of unsolved murders, seeing as they overlook the basics when investigating them. And yes, to your point about them releasing him, not only do they let him leave the precinct as the only suspect in a murder, HE LEAVES TOWN! And the dummy he thinks killed his wife becomes his new bosom buddy, and goes everywhere with him. He doesn't even put it back in it's case...he props it up in the car like it's a passenger and even lets it watch him sleep! Anyway, I said most of this in the podcast. I will say Dead Silence is a movie to check out, because it is a frightening film. I just think a little more thought should have gone into the character's actions. Each and every one of them (with the exception of Mary Shaw) comes off looking like a moron. I'm glad you liked the episode, and hopefully you'll enjoy the movies as well. Please be sure to stop back and let me know what you think once you've had a chance to see them. Thanks again, and thanks also for listening to Planet Macabre. you are getting funnyier each show the comment to the hunter 'you are have promlem with opening credits' had me in stitches i was thinking the sam thingy. i will try frankunstine per yer reccomendasion. @Veronique: Thanks so much for stopping by. I appreciate the compliment, and please he sure to stop back and let me know what you thought of FRANKENSTEIN. BTW, you live in a city I would LOVE to visit someday! Glad to see we've got listeners in Paris. Thanks for stopping by, and for the comment. Glad you liked the episode (and yeah, it certainly did get a little intense, didn't it?). A quite nifty episode discussing spirited dolls. I liked the intense debating and ratings. Frankenstein is a jewel of horror. Can't go wrong with any Universal horror movie. @W.C.: Thanks for stopping by! I'm glad you enjoyed the episode, and yeah, things got a little intense, didn't they? I was talking with Billchete the other night, and we were laughing about it. As I think I said earlier in this comment string, I don't remember FEELING as angry as I sounded on the show! As for Universal Horror, I couldn't agree more. You can pull any title out of a hat, and odds are it's a classic film. Thanks again for stopping by, and for listening to Planet Macabre. I'm back been awhile it has been busy around here and haven't been able to visit my normal rotation of websites but I haven't missed any episodes that is for sure. A bunch of great episodes all were really good and fun. Frankenstein is another good selection. Thank you once again for all the hard work on the podcast. I'm glad you've been enjoying the episodes, and thanks for the comment on Frankenstein. It's always been a favorite film of mine, and I believe it's the best of Universal's early horror films. Thanks also for your continued support, and for listening to Planet Macabre. Have a good one!